Since as far back as I can remember, and that’s rather a longish patch of time I must mention, I’ve been pulled by the temples of Kerala. If I try and get objective about it, there are a number of factors that may have contributed to this, but while these may well have been necessary, they do not seem sufficient to explain the extent of the significance that very many of these temples have for me. 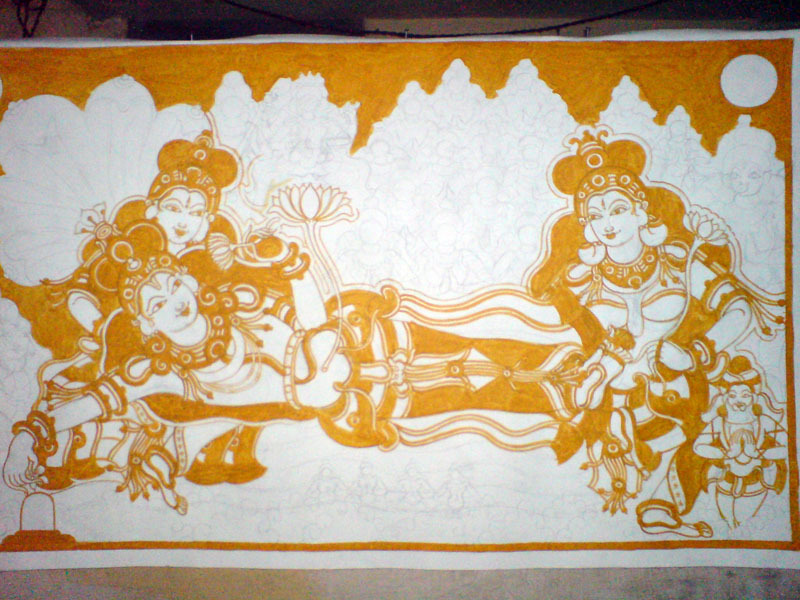 I hope to explore these in some other posting but for now, this is only meant to serve as the context for how I came into contact with the mural paintings of Kerala. 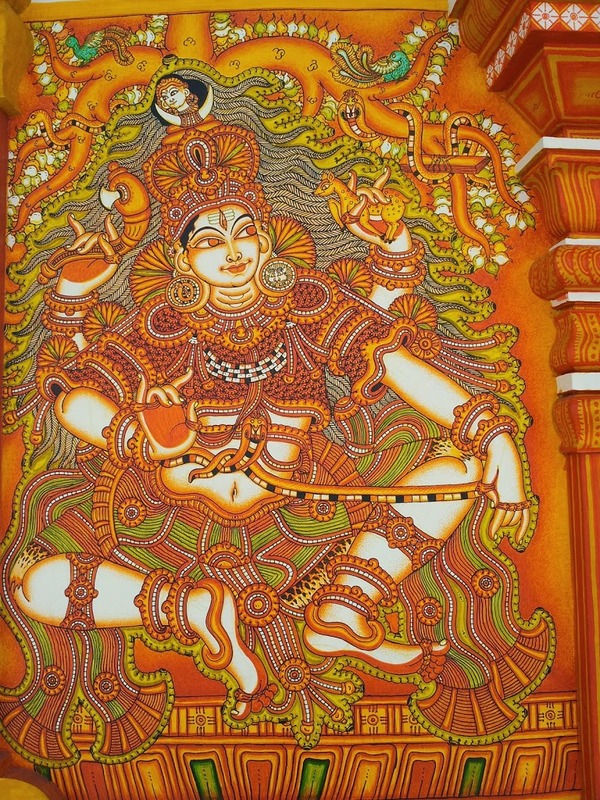 I still have fragmentary memories of walking slowly around the sanctum of the Guruvayur temple, drinking in the amazing scenes painted on walls of the shrine. Over the last year or so, I’ve gone on to find that these are not among the best work there is and not the only style either, but that too is another story altogether. 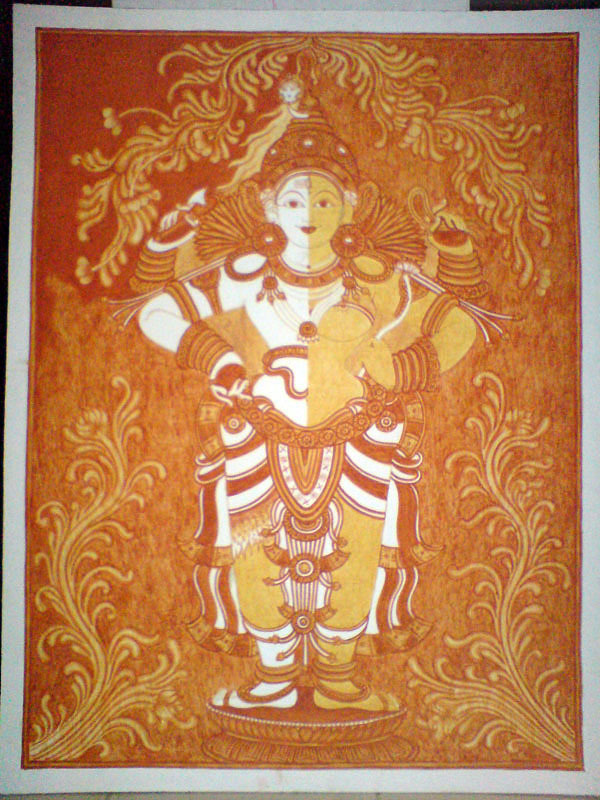 About a year ago, I literally stumbled onto the only institute that I’m aware of that offers a course in mural painting, based in Guruvayur itself. And the ongoing endeavor to catch a glimpse of the Goddess began! 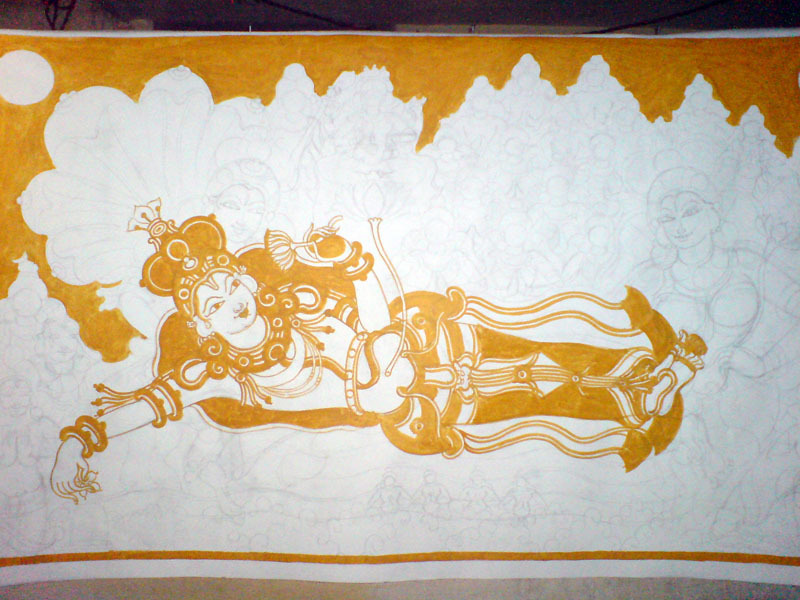 The image alongside is the first that I had done, of a Pana-Yakshi, literally meaning Yakshi-beneath-a-palm tree. 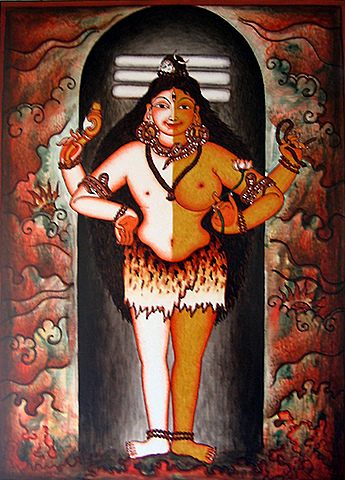 The Yakshi is a Pre-aryan ‘female earth spirit, accepted as a symbol of fertility by the Hindu, Buddhist, and Jain faiths. (The Art Institute of Chicago). 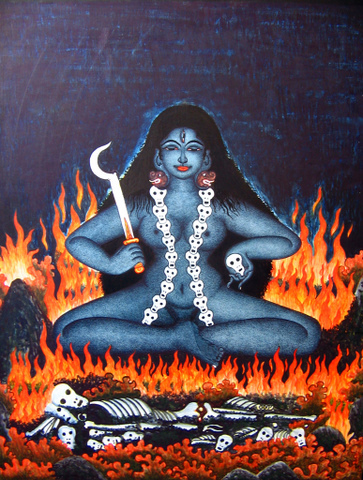 And in case you’re interested check out the interesting online exhibition on Devi: The Great Goddess at the Arthur M. Sackler Gallery and Freer Gallery of Art, Smithsonian Institution. 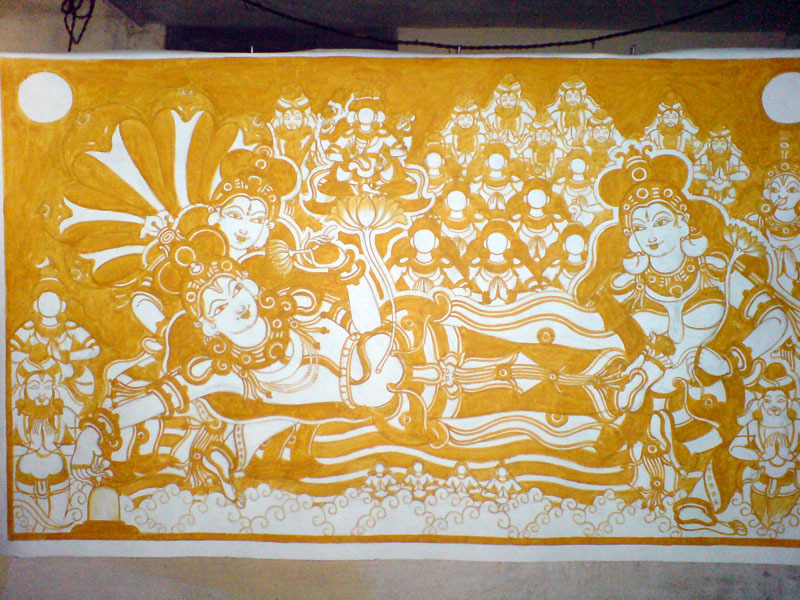 This image is completely traditional both in style and treatment of the subject. What it achieved was to whet my curiosity, sharpen my desire, and fire up my imagination. To explore whether I could get closer to the Goddess. Who in some strange way is within me. I’d always caught glimpses of her, within and without, in the most unlikely of places as also the expected ones. Perhaps it was time to move the story out from backstage, into a more visible space. Perhaps it was waiting to happen and the time had come. And perhaps this is simply a journey into the sensuous-voluptuous! 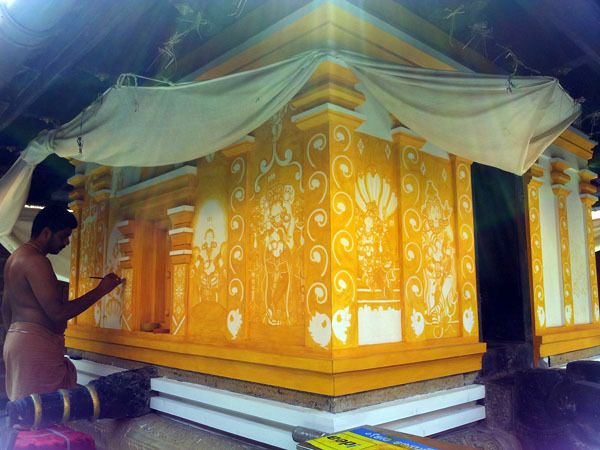 Naveen at Work: Vetta Saastav, Mahaganapathi Vattom Temple, Sultan Bathery, Wynad. 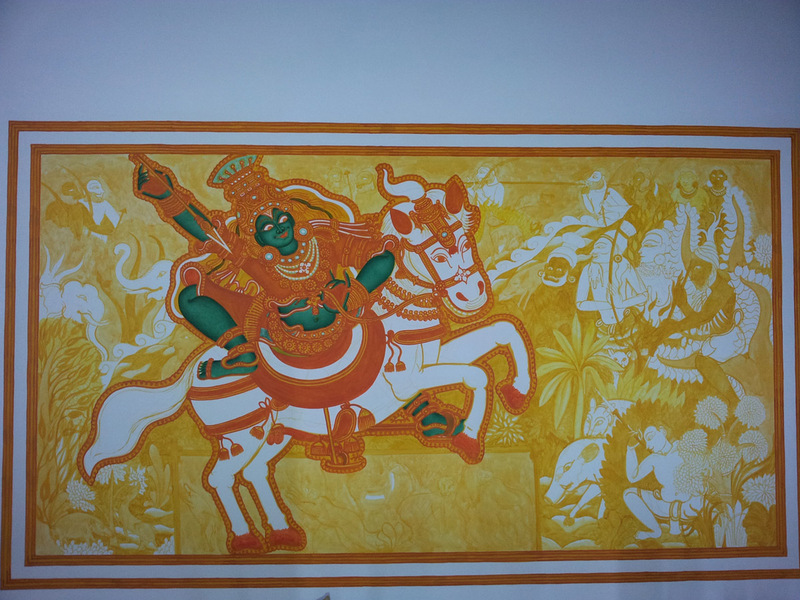 lots of information about kerala murals.expecting more about different pictures.thanks for info.